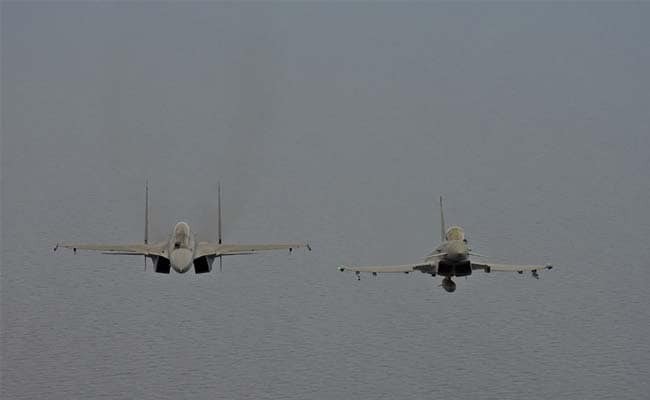 New Delhi: In some of the most intense international air combat exercises ever featuring the Indian Air Force, IAF pilots flying Sukhoi Su-30 MKI fighters had a resounding 12-0 scoreline in their favour against Royal Air Force Typhoon jets in Within Visual Range (WVR) dogfighting operations. In subsequent Large Force Exercises (LFE) which featured combined Eurofighter Typhoon and Su-30 formations, the IAF jets were somewhat less successful but consistently held an edge over the Typhoon. In an exclusive interview, Group Captain Ashu Srivastav, the Contingent Commander in the exercises, told NDTV that the performance of his pilots was "exceptional." 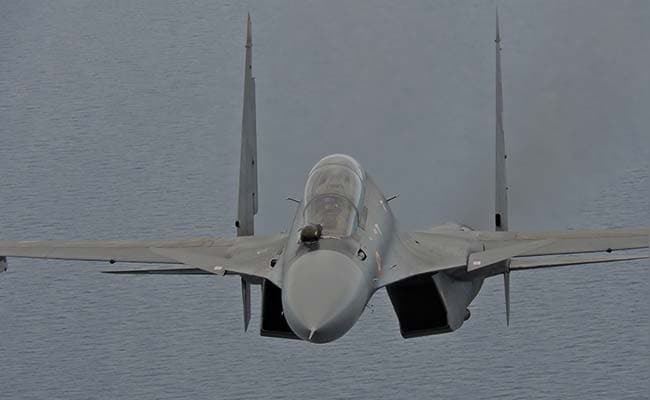 According to Group Captain Srivastav, who happens to be the IAF's most experienced Su-30 pilot, his pilots showed "flexibility and adaptability to a new environment and operating conditions and on this benchmark, I would rate them exceptional." An Indian Air Force Sukhoi Su-30 MKI taking part in the Indradhanush exercises. The 10-day exercises which commenced on July 21 was the fourth edition of the Indo-UK Bilateral exercise called 'Indradhanush'. IAF aircraft and personnel were based out of three Royal Air Force bases: four IAF Su-30 fighters operated out of RAF Coningsby, C-17 and C-130J Hercules transports were positioned at Brize Norton and Garud Commandos of the IAF operated alongside British forces at RAF Honington. The IAF also deployed an Ilyushin IL-78 air to air refuelling tanker at Brize Norton. Inside the cockpit of an Indian Air Force C-17 Globemaster transport aircraft, which was part of the Indian contingent to the Indradhanush exercises. The IAF fleet departed India on July 15, with the fighters refuelling twice mid-air ahead of their first pit-stop at Taif in Saudi Arabia (near Jeddah). The formation then proceeded to Athens on July 16, refuelling once before their arrival. After another halt for one night, IAF aircraft flew onto the UK again refuelling once mid-air. For the Royal Air Force, the chance to train against the Russian-designed Su-30, arguably the finest fourth generation fighter aircraft in the world, is rare. India is the largest international operator of the super-maneuverable fighter and was equally keen to pit the skills of its Top Guns against the RAF's new Eurofighter Typhoon, the mainstay of the RAF's fighter fleet. The first week of the exercises pitted the Su-30, which NATO calls the Flanker, in a series of aerial dogfight scenarios. First, there were 1 v 1 encounters, where a single jet of each type engaged each other in Within Visual Range (WVR) combat, firing simulated missiles to a range of two miles. The exercises progressed to 2 v 2 engagements with two Eurofighters taking on two Su-30s and 2 v 1 exercises where two Sukhois took on a single Typhoon and vice versa. Notably, in the exercise where a lone Su-30 was engaged by two Typhoons, the IAF jet emerged the victor 'shooting' down both 'enemy' jets. In all dog fighting exercises, IAF Sukhois were able to turn sharply into the extremely agile Typhoons using their thrust-vectored engines to keep the RAF jets locked in their sights. The Su-30's advanced Infrared Search and Track System (IRST), a passive sensor, which cannot be tracked, proved to be a distinct advantage for the IAF's pilots in close-combat maneuvering. Both the IAF and RAF used the full capabilities of their onboard radars, albeit in training mode, which meant that actual radar frequencies used in combat conditions were never exposed for confidentiality reasons. However, the detection ranges of the radars of both aircraft were not curtailed per se. This was air combat as close to the real thing as possible. The pilots themselves ranged from young Flight Lieutenants to senior Group Captains from either side drawn directly from Typhoon squadrons and the IAF's 2 Squadron, The Winged Arrows, based in Kalaikunda. The idea was for both sides to expose their operational pilots to a modern frontline platform of the same class. Accordingly, the IAF did not deploy any senior pilots serving with its Tactics and Air Combat Development Establishment (TACDE). By the time the exercises shifted to Large Force Engagements (LFE) in the second week, IAF pilots were comfortable operating in British conditions. The Large Force Engagements saw mixed formation scenarios where the IAF operated its jets alongside RAF Typhoons in air battles against fellow Su-30s flying together with other Typhoons. 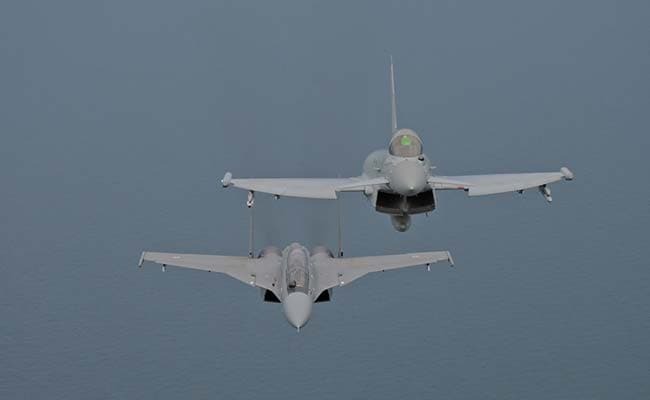 An IAF Sukhoi Su-30 MKI (left) flies alongside RAF's Eurofighter Typhoon. The Large Force Engagements saw 4 v 4 engagements at beyond visual range and graduated to a massive 8 v 8 engagement featuring 16 aircraft in the skies near Coningsby. IAF pilots shared tactical information with RAF pilots in their formations using radio communications since the IAF's data-link system (which shares critical sensor data with friendly aircraft) was not compatible with the Link 16 system in use with NATO aircraft like the Typhoon. Asked about the performance of IAF pilots in these Large Force Engagements, Group Captain Srivastav told NDTV his pilots performed "fairly well" though "quantifying [the results] is difficult". It was not unexpected for the IAF to "lose" one or two jets (over all the Large Force Engagements put together) given that the movement of each formation was directed by fighter controllers coordinating an overall air battle. Both sides agreed to simulate their Beyond Visual Range (BVR) Missiles at 25 miles for offensive missions and 22 miles for defensive scenarios. IAF C-130 and Il-78 jets also participated in the Large Force engagements where they were "defended" by the fighter formations they were flying with against 'enemy' attacks. The IAF also encountered no serviceability issues with any of its participating jets. All Su-30s were available for the daily exercises which took place over two blocks, one in the morning, the other in the afternoon for a total of eight sorties daily. Praising the support the IAF received from the RAF, Group Captain Srivastav told NDTV, "The hosts were very good. They were ready to extend exceptional support." The sense of camaraderie extended to C-17 transport pilots of both sides. According to Group Captain Srivastav, "There was good interaction between young pilots. The C-17 Squadron of the RAF wanted some help in Kathmandu [following the Nepal earthquake]. We helped them then, this was more than reciprocated." RAF pilots showcased their assault landing and combat off-loading experiences with IAF pilots observing from the cockpit of the big jet. 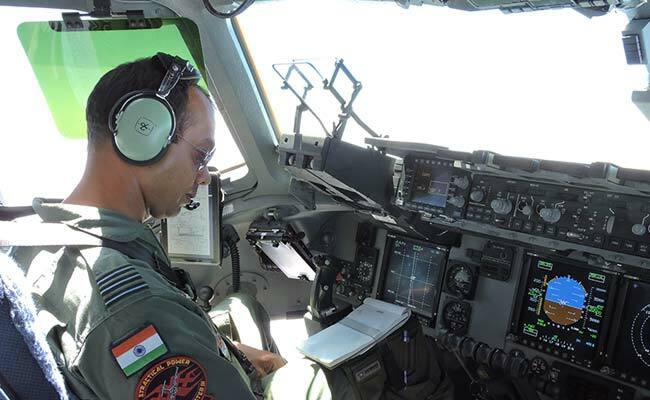 IAF pilots shared their experiences of operating the C-17 at high altitudes. Over the last decade, the Indian Air Force has been very keen to develop its Garud Commando Force meant to protect its assets such as air bases and also be deployed behind enemy lines if required. Operating alongside British forces in the UK, the IAF Garud commandos participated in a 96-hour camp in a training area close to Honington. This involved reconnaissance and surveillance missions and a combat free fall para-jump with British forces. 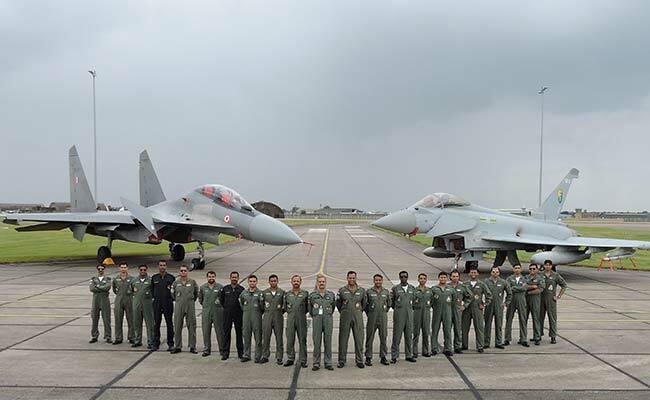 The IAF team which participated in the air combat exercise, with both the fighter planes in the background. The Sukhoi Su-30 is on the left. 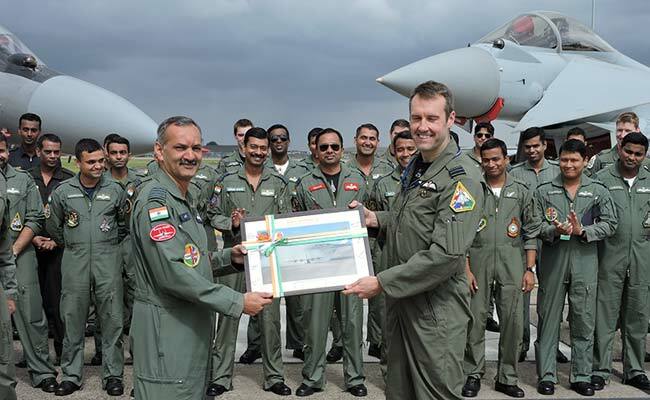 Back in India now, the IAF, like the Royal Air Force, is keen to point out that the exercises were a learning and training opportunity, and should not be seen as a battle between the IAF and the RAF, who are close allies and partners. According to Group Captain Srivastav, "It was all about learning from each others experiences and to fine tune our own procedures." At the end of the day, though, for the IAF, these exercises were about gauging the skill levels of its own pilots and the aircraft they operate. For the IAF, these exercises came as positive news on where they stand against some of the best of the West.